Yet another official announcement: Fuzeboy is now being rewritten in GameMaker Studio 2. After getting familiar with the new UI and the new GML functionalities, I’ve realized it made little to no sense at all to keep using GM:S 1.x. 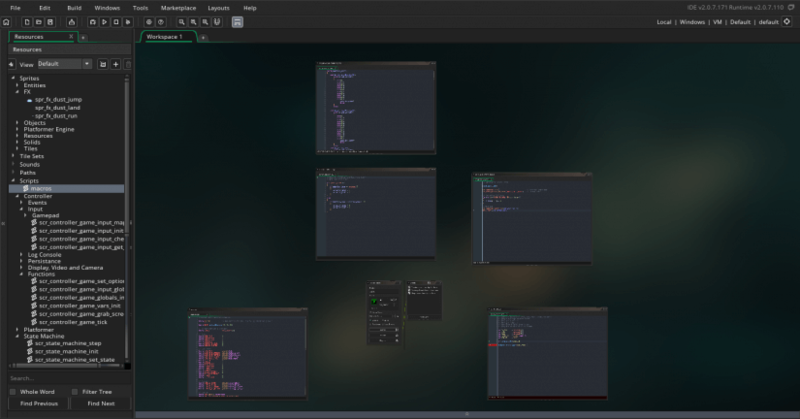 I’m already rewriting Fuzeboy from scratch so I might just use the new, improved IDE. I need a faster workflow and GameMaker Studio 2 definitely improves the workflow. Coding with the new intellisense code-completion and making levels in the new room editor is just fantastic. Since I’m working on a 1366×768 13″ notebook, I set the DPI scaling of GMS2 to 80% (76 DPI) so it doesn’t feel claustrophobic working in it. I already feel better when coding Fuzeboy in GMS 2.